When you sit down to watch a movie you used to love, having not seen it for a long time, there is always the fear that it won’t hold up. 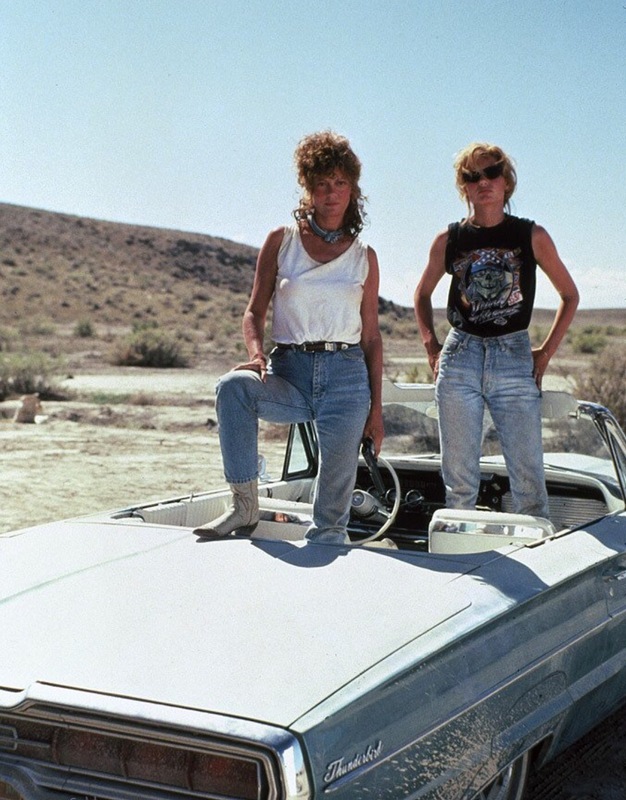 Putting my new Blu-Ray copy of Thelma & Louise into my player last night I had that worry. This was a massive feminist film when it came out but would it have the same power now? Would it still carry the same strong message or would I cringe at what stood for female empowerment twenty six years ago? Well, looking at it now, we probably didn’t need quite so many shots of Geena Davis’ pants but other than that this is still a brilliant film. In some ways it is very much of its time. Feminist perspectives and priorities have changed. By contemporary standards there might be an issue with the end, suggesting that embodiments of the aggressive feminine must be destroyed, but everything happens completely on their terms and they retain all of their control. On the other hand if the film were made now it is hard to imagine that they would cast a 35 and a 45 year old in the lead parts. You’d more likely get Emily Blunt and Jennifer Lawrence, the older of the two being broadly the age of the younger in the original. This type of film sadly doesn’t seem to go to that type of actor anymore. Same fight, different battles. One good thing is that in 2017 this movie would (almost) definitely be directed by a woman there being (marginally) more of them recognised in the business. Susanne Bier or Patty Jenkins maybe, possibly even Angelina Jolie since at 40+ she’s now too old to be in it. Generally though Thelma & Louise has not aged at all. The two main characters are still totally believable and the misogyny they are confronted with tragically no less common, particularly now with Trump’s rise to power shamefully legitimising casual sexism. We need this film now just as much as we did in 1991. Men don’t come off well in the movie. Thelma’s husband is clearly an idiot, comically but realistically so, her attacker is an unimaginable pig and her lover is a selfish thief. Even Michael Madsen’s Jimmy ultimately disappoints. Only Harvey Keitel’s Detective Slocumb remains honourable but he too is essentially powerless. It isn’t anti-male though, it is anti patriarchy. Still, the strength of the movie is not just the way it has its protagonists push back oppressive masculinity. At its heart the film is a coming of age story first and a realistic crime drama second. Its spiritual partners are films like Sugarland Express and Bonnie & Clyde more than they are 9 to 5 and Fried Green Tomatoes. The greatest character journey is Davis’ Thelma’s. She goes convincingly from mousy housewife, married too young and afraid to speak up to her selfish husband, to confident outlaw, robbing convenience stores and holding police officers at gun point. She moves away from being a victim to making others her victim but your sympathies stay with her because she is motivated by defiance of her spouse and loyalty to her friend. She is also very polite. The friend Louise, played with such authentic dignity by Susan Sarandon, is initially the stronger and wiser of the two but she has been where Thelma was and has her own fragilities. It is her past governing her actions that first makes them fugitives and her story is tragic where Thelma’s is victorious. Louise has to leave love behind. 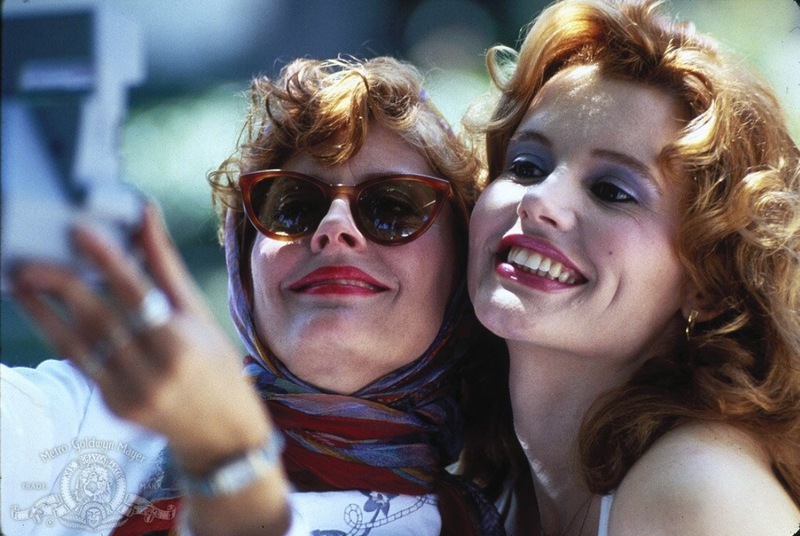 Both Geena Davis and Susan Sarandon give superb performances. At no point do their increasingly atypical actions seem out of character and you totally see how much everything is costing them, emotionally as well as practically. Their affection for one another is clear throughout and the chemistry between the two of them is palpable. I’m struggling to think of another platonic on screen relationship to match it. Hollywood lore has it that neither won the Oscar that year because voters couldn’t decide between them (although it is hard to argue that eventual winner Jodie Foster didn’t deserve the award for The Silence of the Lambs). A golden statuette did go to Callie Khouri for her screenplay though which is entirely right. The writing as much as the acting is absolutely the film’s strength and neither would have been as successful without the other. Thelma & Louise remains 100% relevant then. It continues to be important and it still entertains. (They even take that iconic selfie which is prescient now.) Revisit it if you can or, for those of you lucky enough, see it for the first time.